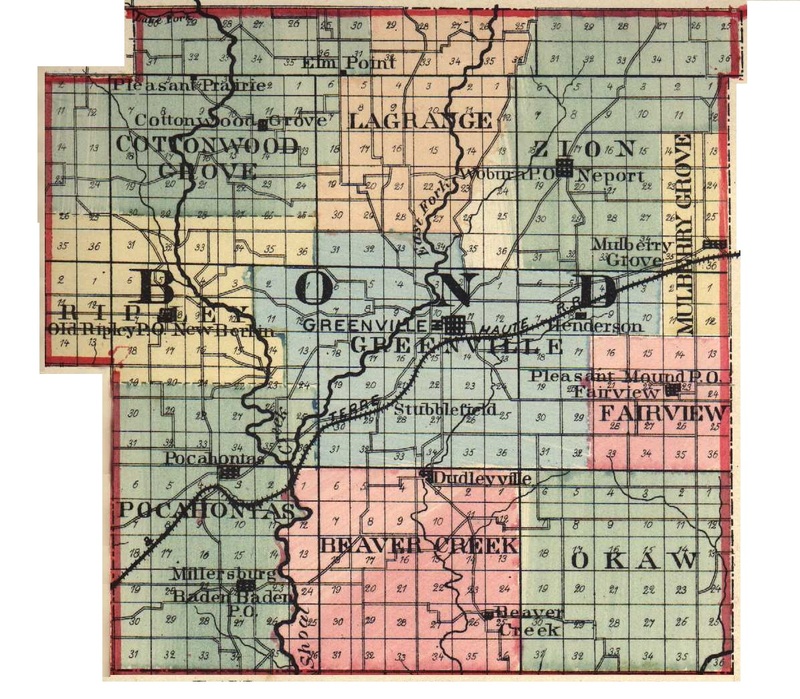 ALBERT J. UTIGER was the efficient County Treasurer of Bond County, and is a prosperous merchant of Pierron, Bond County, Ill. The gentleman of whom this sketch speaks was born at St. Jacob, Madison County, Ill., March 18, 1853. He was the son of Silvan Utiger, who was a native of the canton of Zug, Switzerland, who came to this country in 1837, and located at Louisville, Ky., where he remained for one year. He then came North into Madison County, where he engaged at farming and worked at the trade of a machinist until his death in 1862. Mr. Utiger married Nanette Zumbach, who was born in the same place in Switzerland, and she died at the age of seventy-six years, having been the mother of nine children. Our subject was a twin and the eighth child of the family, and was reared in Madison County and attended the common schools in Highland. At the age of twenty years he was, in the parlance of the villages of Illinois, "given his time," and began life for himself dependent upon his own resources. His first business venture was made in teaching school, and he remained three terms in Madison County, and then secured a clerkship in his brother's store in Alhambra, Ill. Later, he opened a general store at Pierron, with a painter named A. A. Suppiger, and the firm name was Suppiger & Utiger. This partnership in business continued for three years, and at the end of that time our subject was elected to the important office of County Treasurer, and in the fall of 1882 he sold out here and moved to Greenville. Mr. Utiger served in his responsible office until the fall of 1886, when he moved into Alhambra and opened a store there, which he continued for two years; but in February, 1889, he returned here and now has a very large general store at this place. The marriage of Mr. Utiger took place December 17, 1885, to Miss Margaret R. Plant, who was a native of this county. Two children have been added to the household, whose names are Bertha and Laura. The store of our subject is a very comprehensive one and he carries a complete stock of all that the village shoppers could require, and also meets the wants of the farming community throughout the neighborhood for miles. He has dry goods, groceries, boots and shoes, hats, caps, notions and drugs, and in this he follows the example of some of the largest mercantile houses in both New York and Chicago. The political faith of our subject constrains him to belong to the Democratic party, and he feels that in that body can be found the best principles for the government of a republic. When he was elected to the office of Treasurer, he was running upon the Independent ticket. He is a member and supporter of the Lutheran Church, and is a man whose friends are many, not only in the political circles in which he is active, but among his patrons and neighbors, who have testified to their regard by giving him a liberal patronage. Extracted 20 Dec 2016 by Norma Hass from 1892 Portrait and Biographical Record of Montgomery and Bond Counties, Illinois, pages 392-395.